"Oliver fumed. Herman didn't have just any old mountain bike. It was the Easter Racer 500, black with a blue racing stripe, and Oliver had been plunging toilets, mopping floors, and cleaning windows to earn enough money for one. Not only was he working his fingers to the bone, he was penny-pinching as if he lived during the Great Depression. No churros from Manny the churro guy, no books from the library sale ... "
Last night I was so happy to return to Harlem, and the brownstone that the lovely and lively Vanderbeeker family share with their upstairs neighbors, Miss Josie and Mr. Jeet, and their up-upstairs landlord, Mr. Beiderman. I read Ms. Glaser's first book about them last year, and had highly anticipated yet another visit. Isa is at music camp, leaving her twin sister and other three siblings to fend for themselves in the early days of an endless summer. They are having a tough time finding things of importance to do. Sadly, while visiting with their upstairs neighbors, Mr. Jeet suffers a debilitating stroke and must be transported to hospital where it looks as if his stay will be long and labored. The children are worried, of course. This worry leads them to consider what they might do to make Mr. Jeet's homecoming a happy one. Oliver is quick to suggest a dilapidated, overgrown space next to the church down the street as the site for a garden. He gets little support from his sisters. Laney, the littlest, is sure they will be turned into gremlins if they dare to go inside that lot. Oliver is able to convince his sisters that his idea is worth pursuing. Their story is filled with the ups and downs of creating a beautiful space where none existed. Birds, flowers, vegetables, trees, and a relaxing bench for contemplation on warm summer days provide an oasis following a lot of hard work and a few missteps. Their friends are eager to be part of the crew, and the camaraderie that gets the job is a joy for readers. They are a pretty resilient, resourceful, and determined group. What about the developer who wants to bulldoze the garden and put up condos? Who will they enlist to help them save their beloved community garden? Will the Garden Extravaganza welcome Mr. Jeet back from his hospital stay. They have 17 days. In this stellar follow-up to her first novel, Ms. Glaser remains true to the characters she introduced last year. Each has a distinct voice and role to play in the story. Readers come to know them better and appreciate their ability to work together, problem solve, think of others, and bring a tough task to completion. 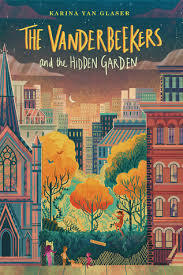 Harlem is a welcoming venue for this family story that would make a terrific read aloud at home, or in any intermediate classroom.